O'Malley's is an Irish Pub in Hotel Radisson in Al Khuwair, which happens to be quite close from the place where I live and I have been wanting to try that place out so one weekday I suddenly planned to try it out so my first time visit was in a Monday, when I went there with a friend of mine quite late around 11 pm. Since it was a Monday night I thought it would be quite quiet and empty but the place was quite exciting and with the crowd vibe. It wasn't crowded or packed but there were lots of tables occupied and the bar counter was filled with customers. The place had a multi-cultural crowd with white people, Asians and Arabs. We grabbed a table in the corner and was greeted by a friendly smiling Filipino waitress. The place wasn't a sports bar as such like Habana in Grand Hyatt but had a screen showing some football match. 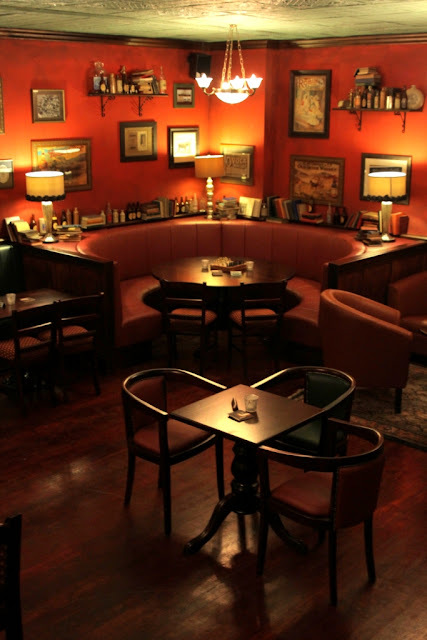 The decor was elegant, with lights and wooden tables and walls giving a touch a the Irish tradition. It somehow reminded me of the Irish Bar back in Kolkata in India, called Dublin in ITC Sonar, Kolkata which has a somewhat familiar decor though this wasn't quite as fantastic as Dublin Irish Pub though. The menu seemed quite okay, as it had all the brands I liked and the prices were also not very high and had the standard rates like the other good bars in Muscat and I guess relatively a bit cheaper too. Since it was a weekday and I was working the next day I thought I would just go with a beer so I asked for a Hieneken pint and the waitress quickly served it in my table. She quickly gave me a bowl of peanuts to go with the beer and it had been a while I hadn't taken peanuts with beer though I quite like it unlike the bars in Grand Hyatt who serve a popcorns complimentary with beers which I don't like much. The place seemed quite vibrant with not so much noise and since it was a weekday, it had the perfect crowd not making it crowded and noisy but not empty and silent too. I asked for a pint of Stella too and then ordered for a bottle of Corona. I love Corona especially the way it is served with the Mexican tradition of having a lemon wedge in the bottle neck. I guess O'Malleys is quite a nice place to go once in a while at Radisson Blu in Al Khuwair to grab a drink with friends and have long chats with. So, for me I would rate O'Malleys 8/10.